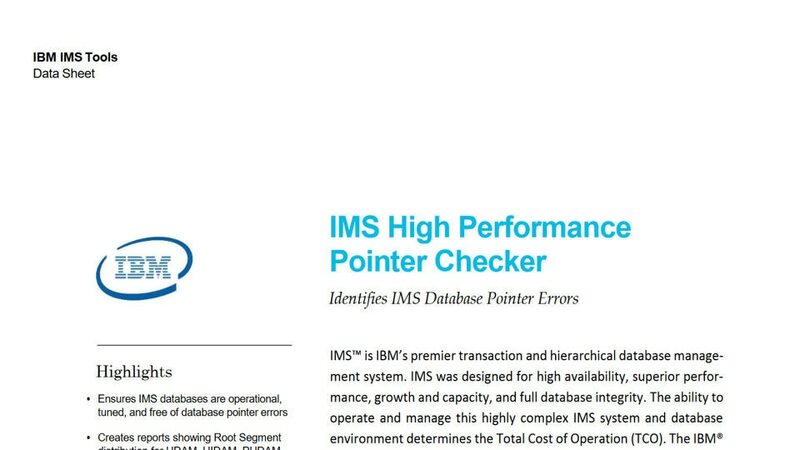 IMS™ High Performance Pointer Checker for z/OS® monitors space utilization and detects and reports physical or logical direct pointer problems. These reports pinpoint both the errors and their locations within the IMS database. It also generates reports to better tune IMS databases. It ensures IMS databases are operational, well-tuned and free of pointer errors. Monitor databases regularly, to detect either direct pointer errors or the need for a database reorganization. Analyze a corrupted database as part of the repair process, reducing the diagnostic and repair time spent by programmers or analysts. It also allows you to reduce the amount of time spent to diagnose and repair them. Get reports to facilitate system tuning, report space utilization and detect and report problems in primary and secondary indexes. Interactively and in batch mode, it repairs VSAM- and OSAM-organized IMS databases that contain pointer or data errors. Reduce the time that the affected database is taken offline. View entire blocks of data or individual IMS segments and navigate to other segments. Any changes that are made are tracked and can be undone. Dump blocks from the data set or submit changes to the block data.